Mix the hamburger meat, ginger, garlic and soy sauce gently in a bowl. Separate into four parts and make four patties. Salt and pepper both sides. Grill over a gas or charcoal grill until done (or cook on the stovetop in a large pan). Combine all ingredients and set aside. If you are preparing this in advance, store in the refrigerator. Toast the hamburger buns. Slather the bottom with the Wasabi Mayo. Add the cooked hamburger and top with Asian Slaw. Enjoy! 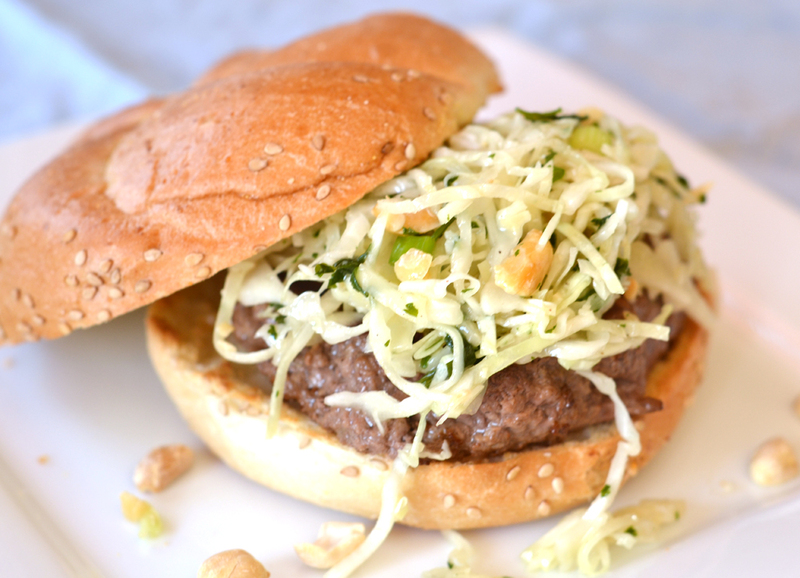 Love the flavours in this burger, Mindy, plus the zing of the wasabi mayo. New follower. This looks so good. This looks great!! love your photos... No more regular burgers for me. I never tried this Asian burger recipe. I will add this to my favorites alongside the tofu burger and bulgogi burger.